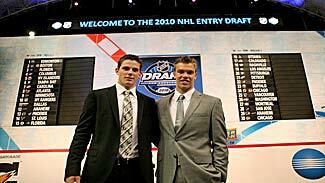 LOS ANGELES -- The first-round picks of the 2010 Entry Draft flooded into the streets of this star-obsessed city Friday night, basking in their new-found fame. For those who just missed the cut, it was a far different experience. While Nino Niederreiter, the No. 5 pick Friday, celebrated late into the night while still wearing his first NHL jersey and countless other first-rounders hunkered down across the sprawling L.A. Live complex nearby to celebrated with family and friends, some high-ranked players trudged back to their hotels pondering what could have been. While No. 1 pick Taylor Hall, who went to Edmonton to open the draft, planned a celebratory trip to Disneyland, Tyler Pitlick, the nephew of former NHL defenseman Lance Pitlick, was left to figure out how his dream had been derailed Friday night. To say it was a long night of tossing and turning would be an understatement. "It was a little tough," Pitlick admitted Saturday, moments after the Edmonton Oilers made him the first of the 180 players taken on the second day of this year's Entry Draft. "I really wanted to go in the first round. It's been a goal of mine since Day 1. But, I'm here now and I went first in second round and I'm really excited. "I was a little disappointed. I was really hoping I would have gone that day, but I'm here today and went first, so I can't be too unhappy." In the end, it was a Friday night talk from Pitlick's agent, Chris McAlpine, who got the player through the night and delivered him to his destiny Saturday morning. "I talked to my agent and he said, 'Don't worry about it … it's not the end of the world,'" Pitlick said. "It doesn't matter exactly where you go in the draft; it is what you do after the draft, how you play after, the things you do after the draft, and the progress you make after the draft. "I'm not too worried about it. I'm in a good spot here and I think I'm going to do well." McAlpine knows the drill better than anyone. He was drafted in the seventh round, No. 137, by the New Jersey Devils in 1990 and beat the odds through a combination of hard work and fortunate breaks to eke out a 289-game NHL dream that stretched over eight seasons and seven NHL teams. "Sometimes, in the draft, it is difficult to manage expectations," McAlpine told NHL.com Saturday. "Like I told him, this is just a snapshot in time. If he keeps working, he could pass a lot of these guys." While Pitlick was digesting McAlpine's pick-me-up speech, a pair of friends from the United States National Development Program Team talked well into the night, reassuring the other that better things lay ahead. "Not about where we were getting drafted," Jonathon Merrill stressed. "We just caught up a little bit and tried to keep it loose." "We just talked a little, how his night went, what he thought and stuff," confirmed Justin Faulk, who ended up being the first of the two friends drafted. Faulk was taken at No. 37 by Carolina, finally putting paid to the stress and anxiety that had consumed him in the latter stages of Friday night's first round and the first few picks of Saturday's six-round conclusion. Fortunately, Merrill didn't have long to wait after Faulk went off the board, chosen by the New Jersey Devils with the very next pick. "Personally, I thought Merrill was going to go before me," Faulk admitted. "It was not really any competition; we're real good friends." Once the drama was over, it was time to celebrate all that they had accomplished, to revel in a bond that was forged during a grueling NTDP season that ended with an Under-18 World Championship gold medal. "You always hope to go as high as you can and be the best you can be, but I'm just happy to be here at the draft and get drafted at all, so it's unbelievable," Merrill said.